Boston - Dias Kadyrbayev was driving back to his apartment when he got a call from a college buddy. 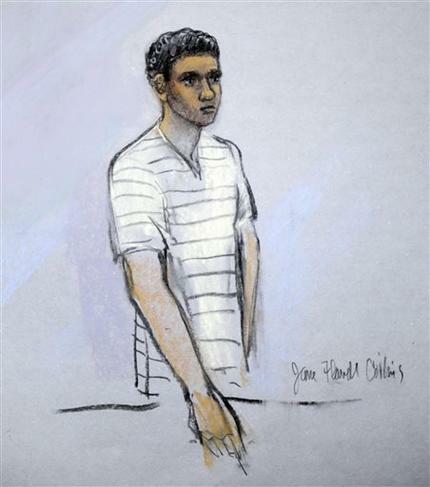 A clearly anxious Robel Phillipos told him authorities had released photos of the alleged Boston Marathon bombers - and one of them looked very familiar. When he got home, Kadrybayev turned on the television to see a shaggy-haired Dzhokhar Tsarnaev, his friend, classmate and, by then, one of the most wanted men in the world. That call set in motion a series of events that on Wednesday turned three college pals into key figures in one of the largest terrorist investigations ever on U.S. soil. According to an FBI affidavit based on interviews with all three men, this is how it played out. Kadyrbayev first met Tsarnaev in 2011, when they both started at the University of Massachusetts at Dartmouth, south of Boston, near the base of Cape Cod. He told authorities he became “better friends” with the ethnic Chechen in spring 2012, and that he was a frequent visitor to the rundown Tsarnaev home in Cambridge. Kadyrbayev and fellow Kazakh, Azamat Tazhayakov, hung out together on and off campus with Tsarnaev. The three 19-year-olds often spoke Russian among themselves. Kadyrbayev, an engineering major, was headed back to the New Bedford apartment that he and Tazhayakov shared when Phillipos called. It was April 18, three days since the twin bombings that killed three and wounded more than 260. When he saw the images of Tsarnaev and his older brother, Tamerlan, Kadyrbayev texted his friend and told him that he looked a lot like the guy on the television. “lol” Dzhokhar replied, according to the FBI affidavit. Then Tsarnaev’s messages took on a more ominous tone. “you better not text me,” read one. “come to my room and take whatever you want,” read another. A month earlier, during a meal, Dzhokhar had apparently felt the need to tell his Russian-speaking chums that he’d learned how to make a bomb. Even so, Kadyrbayev told authorities he thought his friend’s texts were a joke. The Kazhaks and Phillipos, who’d attended Cambridge Rindge and Latin High School with “Jahar,” as Dzhokhar was known, agreed to meet at Pine Dale Hall, their friend’s dorm. Phillipos, the 19-year-old son of a single mother, said he wanted to see for himself whether the TV reports were true. Tsarnaev’s roommate let them in, saying they’d missed him by a couple of hours. According to Kadyrbayev, the trio decided to watch a movie (he didn’t specify which one). At some point, they noticed a backpack. Inside, they discovered more than a half-dozen fireworks, each about 8 inches long, according to the affidavit. The black powder had been scooped out. Kadyrbayev said he knew instantly that his friend was indeed involved in the bombings. But instead of calling authorities, he told investigators he began thinking of ways to get rid of the evidence. Just in case the roommate thought he was “stealing or behaving suspiciously” by grabbing the backpack alone, Kadyrbayev decided to take Tsarnaev’s laptop as well. The three returned to the Kazhaks’ apartment and watched news reports of the intensifying manhunt. They discussed what to do with Tsarnaev’s things. As the situation’s gravity began to sink in, Phillipos - whose own text to Tsarnaev went unanswered - said everyone “started to freak out,” according to authorities. The other two men began speaking to each other in Russian. Around 11 p.m., according to Phillipos, Kadrybayev broached the topic of ditching the stuff. Phillipos says he replied, “Do what you have to do,” then managed to drift off to sleep. When he awoke from his two-hour nap, the backpack and computer were gone. By then, 26-year-old Tamerlan Tsarnaev was dead, cut down in a hail of police gunfire, then run over by his fleeing brother. Later that night, the three friends’ college buddy, bleeding from several gunshot wounds, surrendered from his hiding place under a tarp covering a boat in the backyard of a home in Watertown. On April 26, authorities found the backpack in a New Bedford landfill. According to the affidavit, it contained the emptied fireworks, a jar of Vaseline and a UMass-Dartmouth homework assignment sheet from a class in which Dzhokhar Tsarnaev is currently enrolled. These so-called friends should be treated no better than mudd; Dr. Samuel Mudd that is. With intent they sought to protect terrorist murderers. Anyone out there know who Dr. Mudd is? The guy that treated Lincoln assassin, Lee Harvey Oswald. No?